But for me it still did not work. Or rather calls went through once in about five attempts. That was a week ago. Todays test worked first time. Voice quality was good, not as good as pure GoogleTalk, but better than SkypeOut (at least my last few calls with SkypeOut have been rather poor). My overall impression is that it is heading in the right direction, but has a long way to go. 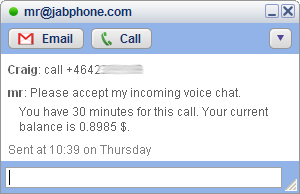 It is not nearly as polished a product as SkypeOut, and having to initiate the call with a text message is a minor inconvenience, but an inconvenience nevertheless. No dialpad is more serious. I view this as an alpha level service. I am a bit surprised it is 'on the market'. Hopefully they get it dramatically polished up before it develops a negative image.